August and September were busy months for Cycle-Smart as we took on the most ambitious camp schedule to date. We began in Southampton, Massachusetts at Glendale Ridge Vineyard for the first two camp weekends. Week one brought torrential downpours and unique mud conditions which are a rarity for a camp held in early August. Campers enjoyed the experience of riding in slick mud as well as deep ruts, features which they will undoubtedly be prepared for later in the season. Week two campers experienced "better" weather, and therefore, drier and more difficult sand conditions in both the sand pit and the Massachusetts camp's newest feature, the solar fields. This feature, reserved for our advanced campers,m includes steep climbs, logs, twisty singletrack, off-camber, sand and more, and demonstrates that even the best 'cross riders can still gain valuable skills by attending a Cycle-Smart camp. Next up, Coaches Michael van den Ham and Shaun Adamson hosted Alberta Cross Camp in Edmonton, AB. From Coach Michael van den Ham: " I find it incredibly rewarding to take everything I've learned in my time at Cycle-Smart, racing in Europe, and travelling the North American circuit and share it at the Cycle-Smart Camps. People don't always realize it, but going faster in 'cross is about a lot more than just pedalling hard. And I think that's the beauty of the Cycle-Smart Camps - it doesn't matter how many watts you make, we can teach you something to make you better." Coaches Michael van den Ham and Dylan Postier demonstrate cornering technique. Photo: Janice Checchio. September brought the Cycle-Smart coaches to Charlotte, NC (Jacob Fetty), Madison, WI (Nick Lemke), and Stillwater, OK (Dylan Postier and Adam Myerson). From Coach Jacob Fetty, " Charlotte Cross Camp with Slippery Sasquatch included riders of all ability levels and ages, from 11 year old riders to 50+ riders. We worked on core technique as well as skills that are specific to North Carolina style racing and specific to Renaissance Park, where the camp was held. There was a nice mix of returning campers and new campers. The camp was well supported by Slippery Sasquatch, complete with a party and cyclocross film showing at a local brewery." Coach Nick Lemke Discusses Cross Technique at Camp in Wisconsin. 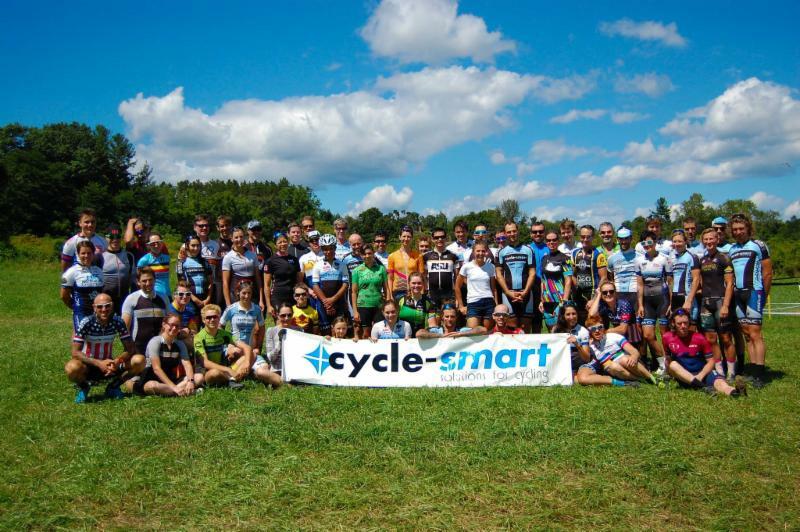 From Coach Nick Lemke: " Revolution Cycle-Smart Cyclocross Camp in Wisconsin was a success. 15 of us descended upon the hallowed ground of not one but two National Championships at Badger Prairie Park in Verona. We used every inch of the park to address mounting, dismounting, uphill carries, steep descents, sand riding, off-cambers, functional hopping, and 'cross starts. Our time together was too short, but packed with good conversation, teaching moments, and some laughs." From Coach Dylan Postier, "Cycle-Smart camp is always one of the most rewarding times of the year. For Oklahoma, it falls just a few weeks before the season kicks off when people are roaring and ready to roll. It is always rewarding to see riders across the spectrum improve so drastically over the weekend. This year, we had a large group of returning campers from our first year. The riders that were back from the first year stood out in the group compared to the new riders. It was unbelievable to see how much better they got over the last year by practicing all their technique. Every one of them looked and rode like seasoned veterans. We were able to go on to the next level, and I know that the first year campers will be in this same boat next year, which is what makes it so rewarding to lead these camps. " Feel like you missed out on 'Cross Camp? It's not too late to learn the ropes from one of our amazing coaches! Jacob Fetty will be hosting a clinic on the course at Northampton International the weekend of #nohocx. Stay tuned for registration information and more details! Natalie Tapias wins the cat 1/2/3 women's race at Sucker Brook CX. Erin Faccone wins the cat 1/2/3 women's race at White Park CX.